Genuine OEM Epson Ink Cartridge Bundle Pack, 515 page yield. Bundle pack includes: one Cyan, one Light Cyan, one Magenta, one Light Magenta, and one Yellow ink cartridge. Epson part number: T078920, T0789. Remanufactured Epson Ink Cartridge, Cyan, 515 page yield. Replaces Epson part number: T078220, T077220, T0772, 78 Cyan. Remanufactured Epson Ink Cartridge, Magenta, 515 page yield. Replaces Epson part number: T078320, T077320, T0773, 78 Magenta. Remanufactured Epson Ink Cartridge, Yellow, 515 page yield. 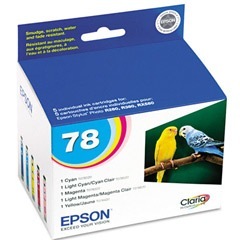 Replaces Epson part number: T078420, T077420, T0774, 78 Yellow. Remanufactured Epson Ink Cartridge, Black, 300 page yield. Replaces Epson part number: T078120, T077120, T0771, 78 Black. Remanufactured Epson Ink Cartridge, Light Cyan, 515 page yield. Replaces Epson part number: T078520, T077520, T0775, 78 Light Cyan. Remanufactured Epson Ink Cartridge, Light Magenta, 515 page yield. Replaces Epson part number: T078620, T077620, T0776, 78 Light Magenta.